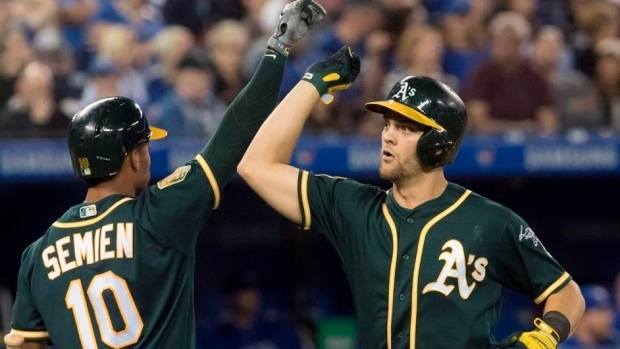 TORONTO — Chad Pinder hit his first-career grand slam in the eighth inning as the Oakland Athletics erased a 4-0 deficit to defeat the Toronto Blue Jays 5-4 on Saturday at Rogers Centre. "There's no better feeling than helping the team win, especially in a big way like that,' Pinder said. "That feels really good." Stephen Piscotty had an RBI single to start the eighth as Oakland (24-22) won its third straight game. Gio Urshela hit a two-run homer for Toronto (22-24), while pitcher Sam Gaviglio had a strong debut as a starter for the Blue Jays. He didn't allow a run surrendering just six hits and one walk while striking out six batters over 5 1/3 innings. He had two previous appearances in relief this season before getting the start against Oakland. "I thought he did an excellent job," Blue Jays manager John Gibbons said. "Not knowing the kid, I thought we (as a team) could have done a better job." Gaviglio, acquired from the Kansas City Royals back in March, looked at Toronto as an opportunity to get a fresh start after struggles with his former team during spring training. With Toronto's pitching bit by the injury bug, Gaviglio offered his team some hope. Following his performance, he walked into the dugout to a standing ovation. "We wanted to go after them right away," Gaviglio said of his gameplan. "We haven't won too many games going deep into counts." Toronto has lost seven of its last nine games and matched their season-high losing streak at three games. A loss in the series finale on Sunday would result in their first sweep against them this season. Urshela connected on a 2-0 change-up from Athletics starter Sean Manaea for a two-run home run in the fifth inning. The ball carried just past the right-field wall and also drove in Dwight Smith Jr., who reached first base after he was hit by a pitch. The home run was Urshela's first of the season. Yangervis Solarte gave the Blue Jays a 3-0 lead with a line drive to centre field. His double drove in Josh Donaldson from second base. Kevin Pillar would wrap up the scoring for Toronto with a sacrifice fly, which drove in Justin Smoak from third base in the fifth. Emilio Pagan (1-0) came on in relief of Manaea in the sixth inning. In the eighth, Piscotty hit an RBI single to cut Toronto's lead to 4-1. The hit chased Blue Jays reliever John Axford out of the game. "I was all over the place. I didn't start competitively. I had four balls right out of the chute," Axford said. "That puts me at a disadvantage right away." With Tyler Clippard (4-1) on in relief for Axford, Oakland loaded up the bases before Pinder hit a 1-1 fastball to right-centre field. "He had a good plan when we went up there, got a good ball to hit and put a good swing on it," said Athletics manager Bob Melvin. Oakland pitcher Blake Treinen collected his 10th save of the season. The Blue Jays fell to two games below .500 for the first time in 2018. NOTES: The announced attendance for the game was 35,786. ... Before the game, Gibbons provided an update on Randal Grichuk. The outfielder is likely to start a minor-league rehab assignment early next week. Grichuk has been on the 10-day disabled list since April 30 with a right ankle sprain. ... The A's recalled right-handed pitcher Ryan Dull from triple-A Nashville. The team also placed left-handed-pitcher Brett Anderson on the 10-day disabled list with a left shoulder strain.